There aren’t many all-female R&B groups in Montreal. 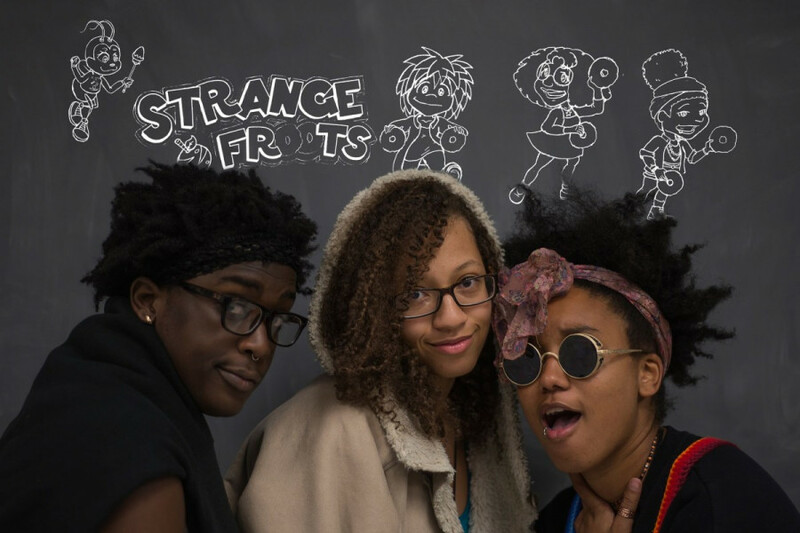 Strange Froots, made up of Naïka Champaïgne, Mags Mbow, and Sage Stewart-La Bonte, is one of the few. I met the boisterous group at a downtown café on an unseasonably hot September day, just toward the end of summer. The group is merry, boisterous, and unabashed, joking and talking over each other. The trio operated as swimmingly as a well-oiled joke machine, anticipating answers and punctuating each other’s sentences, all the while smiling and laughing, clearly enjoying each other’s company as much as the day they all met. Strange Froots spoke to me on the ground the three walk, the message they’re trying to convey, and most, about trying to encourage other young women and POC to get into music and follow their passions. Sage: (Laughs) Over a year ago, now. Mags: We met in June 11 of 2014 at No Bad Sound studio, this studio where kids can record for free. It’s affiliated with Maison des Jeunes de Côte-Des-Neiges. They were looking for girls to be involved in a series of workshops more oriented toward girls because most of the kids coming there are boys. So, that was the first meeting…actually, I met [Naïka] a few weeks before at a jam session in mid-may, where we both heard about this workshop. A few weeks later, we were the only girls there. So, we were like, screw this, let’s start a girl group project instead. Sage: And that turned into our band. Naïka: The rest is history. Were ya’ll involved in music prior? N: I’ve been involved in music since maybe 12 or 13. I went to a musical high school, I had like everyday music classes for those years. I was playing in an orchestra, playing clarinet, and then I transferred to saxophone. Then I realized I wanted to learn guitar and start writing my own songs, so that’s when I started performing for my friends, putting up youtube videos. Played talent shows at my high school, then bars and lounges, then showed up at NBS and met these girls. M: As for me, I’ve been writing songs as long as I can remember. I’d always be writing random songs in my head but never had the way to put them down. When I was 11, my dad introduced me to FL studio because he had a coworker with the program. After school, I would go to his work, and while he was working I would be on the computer, learning how to make beats. Then he signed me up for guitar lessons when I was like 13, we would go to those together. At the school that I went to, Lycée Rochambeau, you had to put on a performance every year for the school fair, and those were mostly musical, involving singing and dancing. So, I’ve always been pretty well-rounded regarding music. S: I’ve always been really into music, but what did it for me was going to the AMC forum for a kids lego contest, where you had to build a tower. I was one of the finalists, so I got a prize – my first beat-making software. From there I graduated to MixCraft and now FL Studio. I just keep trying to improve and make music that speaks to me. N: I know nothing about producing, I’m the one that plays instruments. M: I can come up with a riff on a guitar, but let her do it. N: Our first full-length has a lot of my instrumentation. Anything having to do with producing, I let these girls handle it, because me and computers don’t get along. Where do ya’ll take influence from? S: It’s really hard to pin down a genre with us. M: Until we came up with..what was it? M: I’m definitely more of the arrangement/choreography part of the group. I come up with most of the harmonies, the arrangements and beats, timing and stuff. Singing-wise, I’m maybe the Posh Spice of the group – I don’t have a very wide range. I can sing on key, but I can’t sing very loud. Apparently I can rap. Those are catchy songs, I can’t lie. What’s been your experience in the R&B hip-hop scene here? M: In the hip hop scene, in the R&B scene…even the R&B scene here is very small. I don’t know as many R&B musicians trying to get heard as there are in the trap and EDM scenes. It’s difficult. Whereas for us, we’re three girls, we’re black, we do a lot of stuff, it’s easier for us to pick and choose where we’re involved. Who do you feel like your music is for? M: At first, it started as a mixing and matching of things we took from our backgrounds. But then you realize there are other teens and young girls who were like us once, and they don’t feel like they can put their stuff out there because they don’t think they’re mainstream material. It actually made us think, even a few months back when we played Rock Camp for Girls, and you got a lot of smart girls who want to be able to express themselves musically and not just talk about their typical stuff. I guess that’s who we’re trying to reach – girls that feel ostracized artistically and personally, and they want to feel like it’s okay that they don’t fit in a box. S: We’re all very passionate about that demographic in general because we came together for that soul purpose of inspiring young women. M: We were born out of a lack, so now we feel obliged to carry out that mission. What is the message you think people need to hear? All: Stay cute, stay froot! M: We good. Be yourself, but be respectful. Respect who you are and respect other people, don’t worry so much about how other people are trying to define you. N: Do you. Stay cute, stay froot. Self acceptance. Love yourself. M: Live your life, follow your dreams. Getting into the political side of things, talking about systematic racism, sexism, stigmatization of mental illness…it’s very important for people to know that whether you’re black, you’re queer, you’re depressed, you’re anxious, it’s okay. No one needs to try and fix you, as long as you try to be the best version of yourself. N: We’re all humans, we all have flaws. Everyone has their own issues and their ways of dealing with them. You just have to embrace both your issues and your good qualities and deal with them accordingly. Respect other people’s ways of dealing with their stuff. S: We can all love eachother. Maybe that’s why ya’ll fit so nicely into the Hippy Scene, eh? M: Yeah, but then they all get uncomfortable when we play songs like ‘The Wanderer’, which is our song about racism and fighting white supremacy. N: It goes real deep. How do you feel about that? White people entering hip-hop in a huge way, like white critics trying to direct the conversation about hip hop? How do you feel about white presence at your shows? M: The funny thing is…you mention white presence at our shows, but really, we’re just performing at white shows. It’s not like they have a presence – we’re a POC presence at their show. N: We were literally the five POC there, including my mom, Sage’s mom, and three of our friends. N: Stuff like that gets a little uncomfortable. I don’t think they really get it, you know? M: One of the many reasons we feel like we need to branch out into the urban hip-hop scene. We feel like we need more shows for people in our age group. We find ourselves doing shows for a more adult crowd lately. Where do you want to see Strange Froots go? N: Finish our first full length. But long-term, I’d like for us to travel everywhere and have workshops. Musical workshops, writing workshops, beat-making workshops, everything, for young kids. Just to be there for the community. M: Basically, what NBS provided for us, we should be able to provide for other kids elsewhere. Because, you know, they tried to bring more girls to their program. Not that many showed up, but we came out of it, and now we’re representing them and trying to get more girls involved. Eventually, we’ll move outside of Montreal, outside of Quebec. S: We’re trying to keep the ball rolling.